Local architect Mark Hakoda launched the event back in April at downtown's The ARTS at Marks Garage. Taken from the Japanese word for "chitchat," Pecha Kucha gives designers and artists exactly 6 minutes and 40 seconds to show 20 images of their work. Friday's presentations will include a look at local architecture and its relationship to local food by architects Kyle Hamada and Bundit Kanisthakhon; Kanisthakhon is co-owner of the Tadpole gallery/studio in Chinatown. Other participants include Jesse Arneson, Scott Groeniger, Wendy Hakoda, Tim John, John Koga, Pia Kuhlemann, James McCarthy, Attila Pohlmann, Delro Rosco and Kirsten Rae Simonsen. Pecha Kucha is from 6:30 to 9:30 p.m. Admission is free. Call 597-1155 or visit pecha-kucha.org/cities/honolulu. Japan's love for the hula is well-known, and it will be celebrated this weekend at the 7th Annual Hula Ho'olauna Aloha. The festival celebrates the bridging of the two cultures through dance and friendship, with approximately 600 "hula sisters" from Japan coming to the islands to participate in the two-day event. On Saturday, from 10 a.m. to 6 p.m. on the Ala Moana Center Stage, an exhibition features visiting Japanese and local halau. At the Waikiki Shell on Sunday, hula demonstrations begin at 3 p.m., with competition among the Japanese halau running from 6 to 8:30 p.m. Admission to the Shell event is free to the public, with valid ID in hand. Visit hoolauna.com -- that is, if you can read Japanese -- or call 347-2012 . The always loquacious Jeff Gere has coordinated five Sundays of storytelling, tied to the food traditions and culture in Hawaii and Polynesia, in conjunction with the Smithsonian Institution's "Key Ingredients" exhibit currently in the Kapiolani Community College Library. Starting at 2 p.m., Sunday's "We're Stewed!" program has Gere taking his listeners on a wild swing through food-related myths, dreams and nightmares. Future events include "Ono Writes: Local Grinds!" featuring tasty works by local authors (July 20); the Kenny Endo Taiko Ensemble with Dann Seki and Brenda Kwon offering up some "Spicy Poundings!" (July 27); a "Pre-Cholesterol Talk Story" with Hina Kahanu, Lopaka Kapanui, Makia Malo and Adela Chu (Aug. 3); and "Edible Islander Tales" (Aug. 10) with Tongan Emil Wolfgramm, who will share Polynesian tales and legends, ending with the consumption of his 'umu cooked power-bread using grated coconut. Yum! The event is free. Call 734-9268 or visit kcc.hawaii.edu/object/keyingredients.html. Twenty years ago in the small northern Japanese town of Rokkasho, a nuclear power reprocessing plant broke ground. Sometime this summer, the $20 billion dollar facility will become fully operational. For the past two years, preliminary tests had postponed its operation -- and now, the rest of the world is becoming aware of the plant's potential environmental risks. The documentary "Rokka-shomura Rhapsody" lays out the facts about the situation when it screens 5 p.m. Saturday and 2 p.m. Sunday at the Spalding Hall Auditorium on the University of Hawaii-Manoa campus. Viewers will learn of the North Pacific Current (ocean and wind currents that travel from Japan to the islands), which puts Hawaii at possible risk from the plant. The film also shows what happened at a 40-year-old plant in Sellafield, England, the site of a number of accidents. Guest speakers from Japan, who have first-hand experience with the Rokkasho plant, will also attend the screenings. Admission is $5 general, $3 students and faculty, and free to those 18 and under. Call 531-7873 or visit surfrider.org/oahu. From its name to its shoji exterior, Hinone Mizunone looks like a Japanese izakaya in the tradition of Nonbei or Momomo. Gotcha! That's just a disguise for what is closer to local-style Japanese cuisine ... that is a bit lacking, as well. Preparations are home-style simple and casual, often little more than salt, pepper, soy sauce and ponzu, but it's strange for karaage to lack any kind of Asian inspiration. It felt like I was in the South. The restaurant is a little hybrid operation backed by lofty Japanese philosophy and ambition, but having found that too difficult, has settled for something more accessible and affordable. You may recognize the address as the site of the former Taco Bell, and inside, you'll recognize the Taco Bell arches under the Hinone Mizunone's exterior shell, like fondant over a wedding cake. 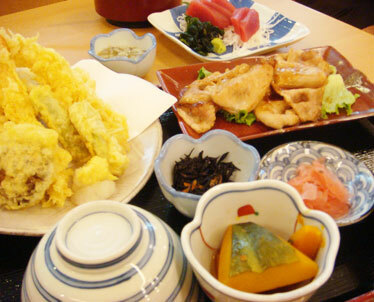 Hinone Mizunone offers a variety of affordable teishoku dinners. The basic menu represents what most people here like to eat. It's hard to go wrong with a two-entree-choice teishoku dinner for $14.75, with two side dishes that differ daily. The entree list includes broiled salmon, saba, misoyaki butterfish, chicken and pork tonkatsu, and hamburger steak with demi-glace that tasted like Western barbecue sauce. If you don't have $14.75, you could also choose izakaya portions of many of the same dishes, as well as about six pieces of ahi sashimi for $8.75, chicken katsu ($6) and tempura ($8) with a stiff, eggy batter. A big deal is made of the rice here, but it seemed no more special or different from the Hinode Calrose most of us grew up with. Service left something to be desired, as can be expected when there are only three servers in a room seating 80. Open 11 a.m. to 9 p.m. Mondays to Saturdays. Dinner costs about $35 for two.